This module discusses the basics of rip current formation and detection as well as the partnerships between the National Weather Service, National Sea Grant College Program, and the United States Lifesaving Association as they relate to rip current safety. This is one of three modules on forecasting rip currents. Interesting information for those of us here in Florida. 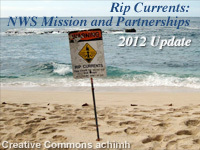 Good module in regards to rip currents. May, 2012: This module has been updated to provide greater flexibility in navigation and linking to specific content. In addition, minor changes have been made to improve the clarity of the content and correct inconsistencies. However, these changes do not affect the overall substance of the material taught.